Recently on thinking about the precise elevation of my desk for making barometer corrections, i happened to notice for the first time that a navigational light that I see every night is about at eye level from my desk. As luck would have it, in that same desk is a precision Kuker-Ranken hand held telescope level, which confirmed what the eye could see, namely that we are indeed very near the same elevation as that light. Now comes the question at hand. The light shows on a nautical chart at a height of 29 ft. But charted elevations are the heights above mean high water (MHW). Checking the chart we find that the MHW is 10.5 ft––that is the only place you find that; it is not in tide tables––and navigators then know that when the the tide is 0 ft, this light will then be 39.5 ft (29+10.5) above the water, and if the tide were 11.5 ft, (1 ft higher than MWH) then the light would be 28 ft above the water. But for barometer work, we need to know the height of the light above mean sea level ( MSL), which is not the same as zero tide. Zero tide in this area corresponds to the MLLW. MSL = (MLW + MHW) / 2. We can usually get MLW from some charts as well. The local chart here gives MHHW, MHW, and MLW. If your chart does not have what you need, you can go to the tide tables to get it. In this case we have MLW = 2.8 ft, so we can call MSL the height of the water when the tide = (10.5+2.8) / 2 = 6.7 ft, which means MSL is (10.5 - 6.7) = 3.8 ft below MHW. So our light is 29 ft above a tide level of 10.5 ft, which means it is 29 + 3.8 = 32.8 ft above MSL––which to a good approximation must be the elevation of my desk above MSL. Fig. 1. MSL defined in terms of halfway point between MLW and MHW. So we have a sort of interesting arithmetic that MSL = ( MHW + MLW ) / 2, which means the increase in the elevation reference of a light from MHW to MSL = ( MHW - MLW ) / 2. All Nautical Charts reference lights and bridge clearances to MHW, but remember they still reference the elevation contours and spot peak heights on the charts to MSL. This latter matter does not enter into routine navigation very much, but it does indeed matter when you are using a sextant measurement of the height of a low isolated near-coastal peak above the water to determine an accurate distance off, especially in areas with a high tide range. This topic has a direct application to setting a ship’s barometer to read sea level pressure (SLP). This if often the Captain’s choice so they do not have to make corrections that depend on their loading or on the stage of the tide. Referring to Figure 2, if the ship’s barometer read the correct station pressure, then the Captain could report the SLP by correcting that reading by the elevation labeled h-water. This elevation must then be determined from h-deck or h-load line, corrected as needed for actual loading (dH). Fig. 2 Ship at dock. But we do not know without a reference standard if the ship’s barometer is correct or not. Ship’s barometers are often checked by the local Port Meteorological Officer (PMO). The PMO can take a well known standard barometer on board and hold it at the elevation of the ships barometer, and any difference noted is the error in the station pressure of the ship’s barometer. This correction can be recorded and applied to the reading before the elevation correction is applied. That is a standard procedure used to check the ship’s barometer, but then to use this barometer reading to report SLP, the Captain or officer in charge must know the h-water at each reporting. The dH is usually well known or can be seen on the side of the hull, but sometimes, the height of the instrument on the ship is not known to a high precision. We keep in mind at this stage, that the goal of pressure reports is to give the SLP accurate to ± 0.1 mb if possible, which corresponds to an elevation uncertainty of (12/0.44) x 0.1 = 2.7 ft.––which we cannot write without wondering about the effects seas on the pressure reading, but that is another topic. The goal of Fig. 2 is to show one approach to either measuring the actual height of the ship's barometer, or to set the barometer directly to SLP, which then removes all factors but dH. For example. Suppose the reference barometer reads 1020.0 at height h-ref = 10 ft above the water, standing on the dock. Then we carry the ref barometer up to location of the ship's barometer and now it reads 1017.5 mb. So there is a 2.5 mb elevation change between the dock height and the ship's barometer height. This corresponds to (2.5/0.44) x 12 ft = 68.2 ft. So the ship's barometer is located 68.2 + 10.0 = 78.2 ft above the water level. But this waterline can change, so we need to know the dH, and the structural elevation of the barometer is 78.2 ± dH as now measured. For the sake of example, let us say the ship is floating 2.0 ft above its reference load line, so the ship's barometer's structural elevation is 76.2 ft above the load line. Thus the elevation correction to the water level for a less loaded ship is 76.2 + dH, and for a heavy loaded ship it is 76.2 - dH. So we have found the elevation needed to convert to SLP at sea (away from notable tides), but if our goal is to actually set the instrument to read SLP, we have to apply these corrections accounting for the present dH and any present errors in the instrument. Suppose the ship's barometer happens to read 1016.3 at this time. The first thing we know is the instrument is not reading the right station pressure. We have sitting beside it a calibrated reference barometer that reads 1017.5. So step one, is raise the ship's barometer to read 1017.5. Then we know it is reading the proper station pressure... and it could be that is the end of the task if we do not want SLP, ie just leave it at that, and the Captain makes the correction at sea for 76.2 ± dH. Notice that we have to say at sea with no tides. If the report is made from inland waters with notable tide, then the right elevation to use is 76.2 ± dH + (Tide - MHW) + (MWH - MLW)/2. This fact also complicates meeting a Captain's goal of setting his barometer to read SLP when at a dock that has high tides. We have to explain carefully what we are setting. Let us assume the goal is to set the instrument to read SLP when at sea with no tide, but we must do this now at a time when the tide is high. Suppose the height of the tide at this moment was 15.0 ft, in a place where MLW = 3 ft and MHW = 13 ft. Therefore, MSL = a tide of 8 ft, so MSL is 7 ft below the present water level. At this moment, then, the ship's barometer is located ( 76.2 + 2 + 7 ) 85.2 ft above MSL. This corresponds to a pressure drop of (85.2/12) x 0.44 = 3.1 mb. So one option might be, set the instrument to read SLP when the tide is zero and the load is neutral, then do a manual correction when these criteria are not met, such as right now! To do this, we just have to undo tide, assuming the water level will then be MSL at sea, and set dH=0. We already know what we need. The height of the barometer above the load line is 76.2 ft. This corresponds to a correction of (76.2/12) x 0.44 = 2.8 mb. Thus we take the correct reading of 1017.5 and raise it 2.8 mb to read 1020.3 mb. This will not be the correct SLP now, but when the ship goes to sea on a level load line, the pressure read from the barometer without further correction will be SLP. Then the ship can just use a short table of baro corrections as a function of dH, and that is all that is needed at sea. MSL correction = ± dH + (Tide - MHW) + (MWH - MLW)/2. In areas with low tides and ships with near constant load lines, this is not a factor, but in parts of Alaska, for example, the tides have 30 or more feet of range, so this could be an important factor. The tide values used here are typical of Puget Sound. Examples: Removal (barometer to waterline) = 5 ft, MLW=2 ft, MHW=10 ft. and dH =0. Then if tide = 13 ft, then MSL correction is (13 - 10) + (10 - 2)/2 = 7. Mean seal level is 7 ft below the surface, and full correction is (5 + 7) = 12 ft. If tide = 0, MSL correction = (0 - 10 ) + 4 = -6. Mean sea level is 6 ft above the surface, so the total correction is (5 - 6) = - 1ft. Other examples and related discussion has been added in this article: Point Four Four per Floor – QFE to QNH to QFF. Piloting Practice with Geocaching — You Can Do It Online. 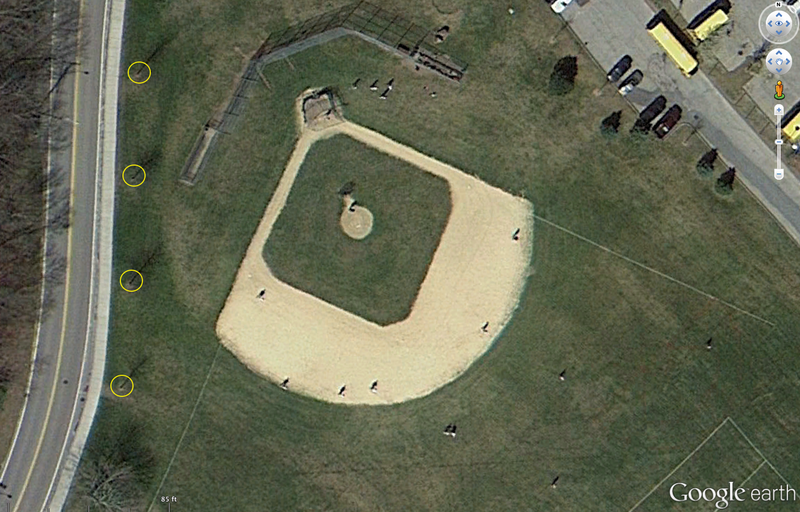 Here is a Google Earth screen cap of the location involved. The objects referred to are the trees, marked here with yellow circles. The center of the tree trunks are your plotting targets. We will come back and annotate this with the vector solutions.... as soon as at least one person asks for it with a comment! (1) Corner of Central Park West and West 69th St. (40° 46.456' N, 73° 58.43' W). 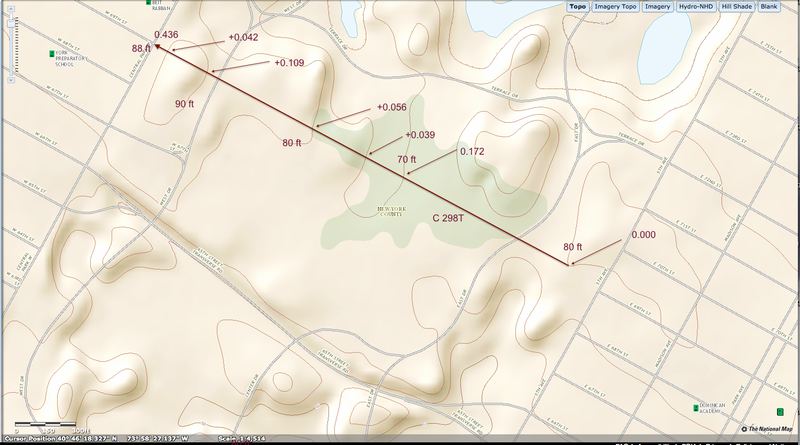 Here is a screen cap of the location involved seen in the nationalmap viewer. The route to be found is the one marked on the image. This is the north end of the park. With little practice you will find that this is a unique location and easy to home in on. The trick is find the approximate location from bulk results, then home in and print, then plot on another paper the elevations at the right separations, then just slide this along the chart keeping it oriented at 298T. This may seem daunting at first, but with little practice you go more or less straight to it. Starpath textbooks function well in several ebook formats. They offer full color graphics, zoom for detailed images, highlight text, search and find. They offer a functional and economic alternative or supplement to our printed books. See www.starpath.com/ebooks for various options. The Amazon Kindle Store and the Apple iBookstore offers free samples and good previews of the texts.